I have a busy week coming up. Thursday I’ll give a presentation at Karlstad University on citizen media and how we work with participatory journalism at aftonbladet.se. Also some important challenges for news sites and some trends I see in the near future. Should be fun. The other speakers are Fredrik Wackå and Robin Hamman, so I’ll be in good company. I’m really looking forward to Hamman’s presentation of the Manchester blogging project and how the BBC is working with educating people to become bloggers through workshops. 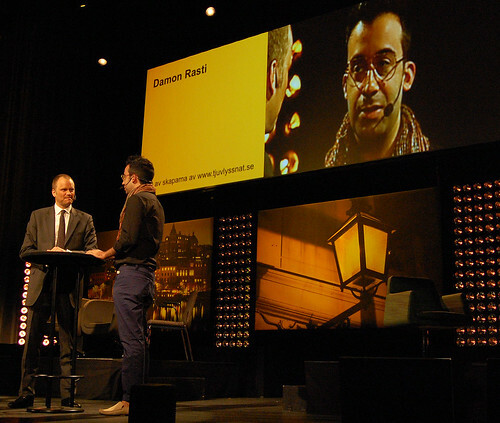 Tomorrow morning I hope to have time to stop by Stockholm Media Week to listen to Damon Rasti talk about web2.0 and a panel on local as ”the new black”. Then on Monday I’ll participate in a debate hosted by the Swedish Journalists’ Union on Citizen journalism – ”threat or opportunity”. It’s to take place at Cafe Aguéli, Blecktornsgränd 9, Stockholm, at 19.30. It’s free and open for all. Jonas Morian hoped for more bloggers/citizen media people in the panel as opposed to journalists, and I can see his concern. Let’s hope for a lot of them in the audience. Yep, we are hiring. If you’re passionate about citizen media and citizen journalism, this might be the job for you. If you’re a Swede, that is, because Swedish is our language of communication. You’d be a part of a small team working with Aftonbladet.se‘s blogs and forums, Bloggportalen, photos and videos our visitors contribute with etc. Most likely you’ll have a journalistic background. Read the ad at Aftonbladet.se and apply before March 15.